Ana stands mesmerised, watching bees crawl about the hive kept in her father’s study. A close-up shot shows her face, bathed in golden light and framed by the dissolving geometry of hexagonal windowpanes. To Ana, the activity of the bees seems mysterious, inexplicable. The Spirit of the Beehive, set in a remote Castilian village in the aftermath of the Spanish Civil War, uses the cinematic and the allegorical to illuminate the young girl's experience of such unfathomable events. The family’s old house consists of quiet rooms, ideal for solitary pursuits. These are interconnected by long corridors and divided by heavy wooden doors, mirroring the tessellation of a honeycomb. Like bees, the family members coexist intimately, yet remain absorbed in their independent undertakings. The house, meanwhile, seems almost to take on the role of a fifth protagonist. Ana’s family is both cradled and imprisoned by it; the allusions here to a larger, war-torn home are discernible. But for Ana, the house is also a world unto its own. It becomes an expansive refuge for daydreams inspired by the film Frankenstein, which is brought to the walls of the provincial town hall by a travelling cinema. Real occurrences become increasingly difficult to distinguish from these fantasies. Isabel, Ana’s older sister, claims that the movie’s monster is a trick, but a cruel prank sees Frankenstein later come alive for both Ana and the viewer. 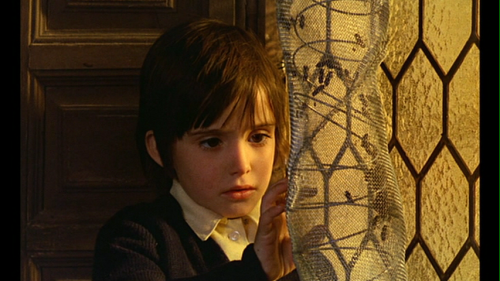 The film-within-a-film trope foregrounds Victor Erice’s interest in the capabilities of the medium, while demonstrating how it can convincingly adopt the perspective of a child. By manipulating spatial and temporal reality, the director offers his audience a privileged insight into another world. A dreamlike excursion into cinematic and socio-political history, The Spirit of the Beehive makes it clear that both realms contain their own beasts. You can watch the original trailer here. Articles about The Spirit of the Beehive available online include those by: Paul Julian Smith for The Criterion Collection, Derek Malcolm for The Guardian, Kim Newman for Empire Magazine, and Bill Gibron for PopMatters. Which films about films would you recommend, and why?